Peru - IOM Peru and the Peruvian Ministry of Interior have signed a Memorandum of Understanding to strengthen cooperation in matters of trafficking in persons and smuggling of migrants. The MoU was signed by IOM Peru Chief of Mission José Iván Dávalos and the Minister of Interior, José Luis Pérez Guadalupe, on the occasion of the launch of the 2016 Blue Heart Campaign, implemented by the United Nations and adopted by the Government. “IOM and the Ministry of Interior have been close partners in working against human trafficking in Peru and this MoU will allow us to further strengthen this relationship and broaden the scope of our actions to combat these crimes,” said IOM Peru Chief of Mission José Iván Dávalos. “More needs to be done to ensure that the public and more specifically, vulnerable populations, are aware of these crimes and the dangers. The mining sector has contributed greatly to the economic stability in Peru, but criminals have also taken advantage of this mining boom to exploit thousands of people,” he added. “IOM has been a very important partner for us in combatting trafficking in persons and this MoU will allow us to expand our cooperation,” noted Director General for Democratic Security at the Ministry of Interior Alejandro Silva. 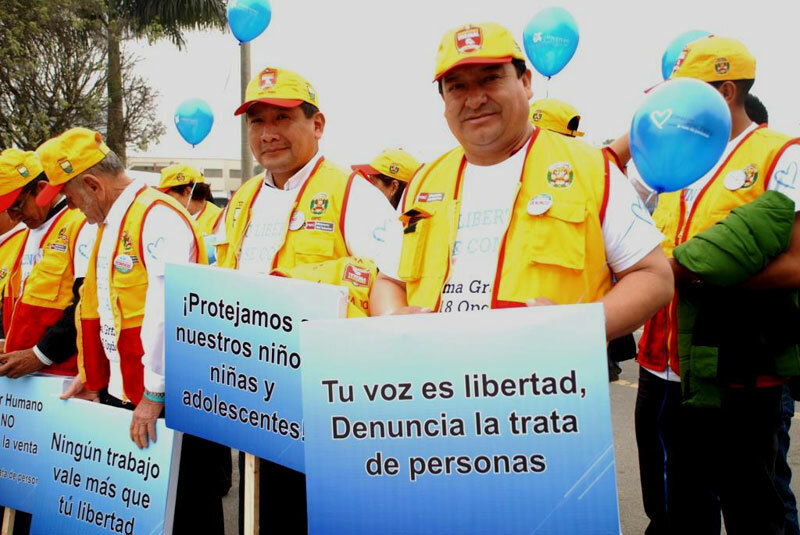 Peru is a country of origin, transit and destination of victims of trafficking. But unlike other countries in the region, the majority of cases of trafficking in Peru are internal, involving young Peruvian women. According to the Ministry’s Criminality Observatory, over 3,900 victims of trafficking were identified between 2009 and 2014. In 2014, close to 80 percent of the victims identified were women and 61 percent were between 13 and 24 years old. After Lima, the regions with the most cases of trafficking in persons are Madre de Dios and Loreto, where the majority of the victims are exploited for sexual or labour purposes in activities related to illegal mining and logging. In the coming months IOM and the Ministry of Interior will work together to develop information dissemination mechanisms, and to provide technical assistance to regional governments to strengthen or create local inter-institutional coordination mechanisms to combat trafficking. For over a decade, the IOM mission in Peru has provided extensive technical and financial assistance to the Ministry of Interior in its capacity as Technical Secretariat of the Multi-sectoral Commission against Trafficking in Persons and Smuggling of Migrants, as well as other key actors.